Monster Hurricane Irma "Extremely Dangerous;" Approaches Cuba, Threatens U.S.
Hurricane Irma, now a Category Four storm, is passing over Cuba, and is about to bring life-threatening conditions to Florida. Sustained winds are at 150 miles per hour, but at Irma's height, they were clocked at 185 miles per hour. Bernadette Woods Placky, chief meteorologist at Climate Central and former WJZ-TV CBS meteorologist, tells Bay Bulletin: "Irma is a beast of a storm and not one to be underestimated. With winds of 185 mph, it is a very strong category 5 hurricane - the highest level of the Saffir-Simpson scale. 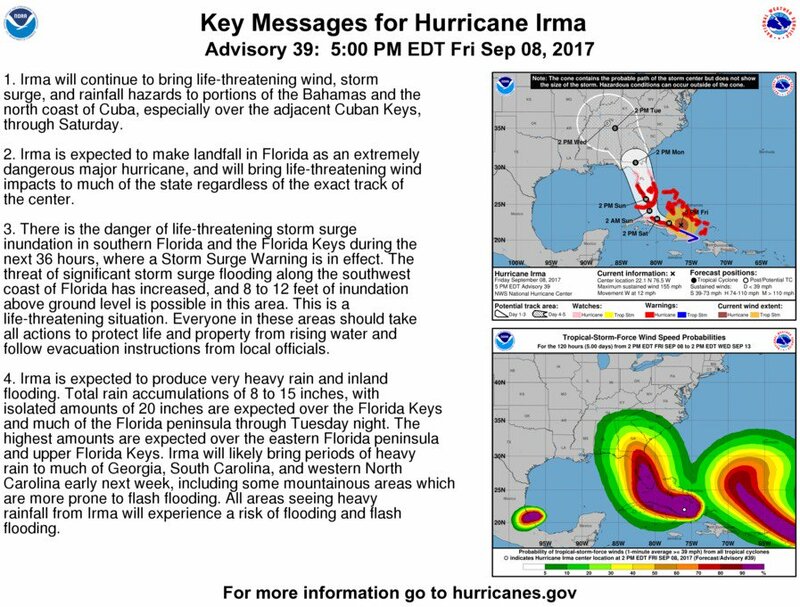 Winds, storm surge, and flooding will all be threats from Irma. We will have a better understanding of how Irma will affect Maryland in the next day or so." By Friday afternoon, Virginia Governor Terry McAuliffe had declared a state of emergency, both to prepare for Irma's impact and to "streamline the process that the Commonwealth uses to provide assistance to other states vulnerable to Irma." In a press release, McAuliffe's office writes, "While the track of Hurricane Irma is still uncertain, it appears increasingly likely that Virginia will see significant impacts from this record-setting storm. The entire Commonwealth must prepare for the possible flooding, high winds, and potential storm surge that could come along with a storm of this magnitude." And in Maryland, Governor Larry Hogan announced he has resources ready to deploy to help the hardest-hit states.